To manage health and safety compliance, organisations require accurate, up-to-date information regarding the validity status of all on-site personnel documentation and accreditations, and each company’s compliance documentation. There is significant evidence that overall productivity increases and the risk costs reduce significantly with the effective ability to govern and manage the process through a task and workflow management system, sharing electronic documents virtually. HSEC Online is an affordable web hosted software service that empowers organisations and personnel to capture, distribute and collaboratively manage company compliance information online and in realtime. This is critical since traditional paper safety files are cumbersome to manage, audit, verify and keep current and up to date. This online document and register management system ensures that all documentation, ranging from a company’s Workman’s Compensation Letter of Good Standing to employee medicals and safety inductions, is always readily available and up to date. The HSEC Online system has been conceptualised, designed and developed by the Saryx Engineering Group and is currently hosted, maintained and supported by a professional team of the company’s developers. Saryx is a dynamic company that takes into account the business objectives, current infrastructure and product knowledge investment of its clients. Its solutions focus on industry standard best practices, intellectual capability, knowledge and infrastructure. Both corporate clients and contractors are required to comply with the industry’s many health and safety regulations, which usually require annual renewal. In many cases, the expiration of certain certifications can take both parties by surprise. This results in a loss of production or service for both corporate organisations and contractors, often carrying significant risk should there be a serious injury or fatality. More businesses highlight the need for a more efficient, cost-effective way to manage their supplier companies and employee documentation, as well as access to their sites and to ensure that all parties comply with the various health and safety regulations – challenges for which HSEC Online provides solutions. Filing and searching of paperwork is extremely resource intensive and requires a great deal of physical space. It is also often difficult to ensure that these paper systems are complete and include all requested and regulatory documentation. HSEC Online allows the client to specify a list of required documentation, for instance a Health & Safety file, and allows the contracting company to submit a digital copy of each document This reduces the requirement for large storage areas and digitally storing documents also makes them easier to retrieve. The client is then able to approve and vet these documents online. The system also prompts users if documentation is missing and reminds multiple people of the non-compliance via email and the web front end, providing them with the opportunity to remedy the situation. This allows managers to see which companies are non-compliant, and allows them to drill down to find which documents have not been submitted. Users are able to search for a single document and view all contractor submissions. Updating of medical certificates and other documentation that affects access to work sites is most often a manual process, which requires the vendor to submit hard copies that have to be collected and processed. This information is then manually processed and updated on the system, sometimes causing delays in allowing the contractor access to site. HSEC Online’s email and dashboard reminders ensure that contractors are aware of documentation shortfalls that require attention. The onus of capturing the dates and details of updated documents thus becomes the responsibility of the contractor. The client management team then simply verify the submitted documentation and approve or reject it electronically. This approval level ensures that the data and documentation is checked and verified, and the likelihood of receiving erroneous data is minimised. There is generally no automated communication between the contractor, applying to have an employee on site, and the client, with both parties often relying on email. HSEC Online allows the contractor, the client and other authorised people to see the status of both a company’s safety file and the status of any applications for new individuals requiring access to a site. Screens are designed so that all parties see exactly the same data and the system allows the site to communicate with the contractor should there be any documentation problems or rejections. When a document or application is approved or rejected, the contractor is notified on the system and can see the full audit trail. Having a paper-based system to handle contractor on-boarding is resource intensive. The contractor will supply a pack of documents to the contractor management team, but unfortunately, they often omit required documentation which results in delays as the team attempts to source the correct data. Once the contractor pack is approved, the data has to be manually entered from paper forms, often filled by hand. Illegibility and errors often lead to the information being captured inaccurately. HSEC Online allows the contractor to update its employee data directly ensuring that ID numbers, names, and employee details are 100% correct. Then, when applying for an individual to have access to a client’s site, they use drop downs to select the individual and submit accurate information electronically to the client. When doing the submission, the system will prompt the contractor for all the documentation required and inform them if anything is missing; only allowing them to submit an application for approval once all company and employee documentation is in order. The contractor management team then simply has to check the documentation and data supplied by the vendors and electronically approve or reject it. On approval or rejection of a document, the vendor is automatically informed via email and the web dashboard that there has been activity on their data submissions. With paper-based arrangements, the access control system has to be updated manually. HSEC Online can be integrated into existing access control systems, which allows the contractor management team to approve or reject a document. This will automatically lock that document on the contractor’s side so that it cannot be modified. Only new versions of the document can be uploaded. Furthermore, it will update the access control system with the new document details that will henceforth either block or unblock the individual’s access. Once the contractor has been on-boarded, there is generally no close off when the individual is terminated by the vendor, or moves to another company. A number of people remain on a vendor’s open badge list, even if they no longer work for the company. With HSEC Online, as soon as a contractor terminates an individual’s employment, the system will automatically notify the client and terminate it on the client database, as well as any access control systems. The Company Documentation module is used to ensure that a business’ regulatory and other mandatory documentation is up to date and readily available. HSEC Online can also be used to store a company’s policies, procedures, tax obligations and compliance, Baseline Risk Assessments, and any other critical documentation that needs to be reviewed periodically. The system will store each revision and simply, but effectively, remind managers when documentation needs to be updated. 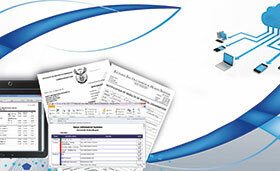 The Employee Documentation module ensures that documentation for employees, including contract documents, safety inductions and annual medicals are tracked. The Asset Register & Documentation module stores documentation like SOPs and registers for equipment, portable tools, fire extinguishers and first- aid boxes. It can also store statutory documentation such as crane load test certificates, sling inspections and calibration certificates. The Ticketing module is an action register that can be used to track tasks and workflow, from minute taking, to disciplinary actions, to tracking near misses/accidents. For near miss and incident tracking the Ticket module is specifically designed so that users can easily capture and investigate any type of safety incident and track the updates on the incident until the incident is closed with corrective or preventative actions. The motivation to ‘paperless’ continues to increase for a number of reasons and with documents being shared digitally, HSEC Online is an environmentally friendly solution. In addition, there is documented evidence that overall productivity increases significantly with the ability to share electronic documents virtually. Further benefits include the fact that the vendor has more control over documentation and safety files; documentation can be vetted and validity confirmed as contractor management (or another responsible person) only needs to verify and approve the submission. The cost and time required to manage paper systems is large by comparison.